12" (widest point) x 9"
Because of its generous yardage, two hanks of 10 ply WoolPak will make two of these bags. Reversing the main color and contrast color will result in a different look. Easy to customize, the pattern offers multiple design options for the creative knitter. 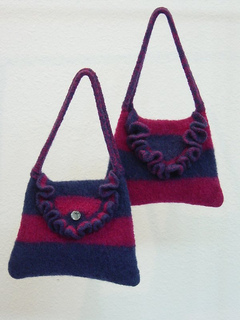 Attention to small details in assembly and shaping after felting will result in a bag with clean, flowing lines and a professionally finished look.